Location: Famen Town, Fufeng County, Baoji, Xi'an, Shaanxi Province. Built during the Eastern Han Dynasty, the temple was damaged and rebuilt many times throughout the years. 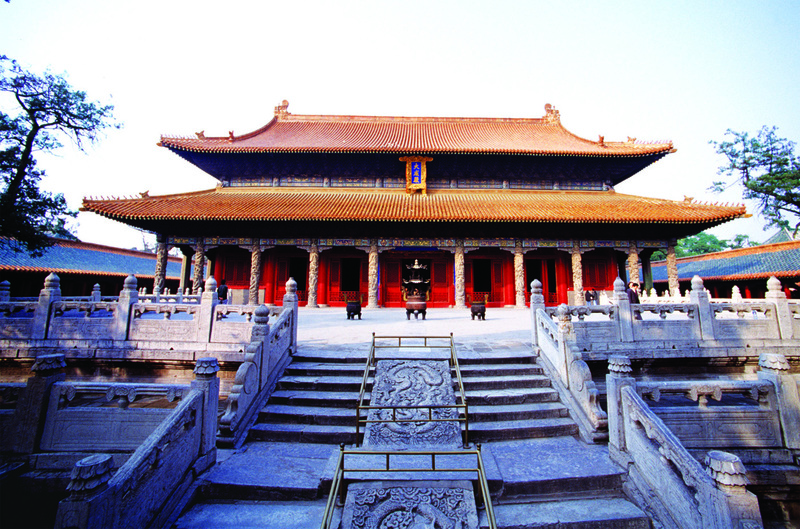 It reached its maximum splendor during the Tang Dynasty when it became an imperial temple. In 1987 the underground palace was opened and numerous Buddhist relics were found, among which the sarira of Sakyamuni. Sarira is a term that indicates Buddhist relics. In Sanskrit, it meant 'body' and of the 4 major relics found here related to Buddha one is believed to be composed of the finger bones of Gautama Buddha. It was preserved in silk within the last of eight concentric boxes. Thanks to the importance of this finding, the temple has become the goal of many pilgrimages. The site includes also the Namaste Dagoba. Dagoba is a term indicating a Tibetan style pagoda. This one was designed by Li Zuyuan a famous architect based in Taiwan. It is 148m tall and is designed in the shape of folding hands. Location: Shendao Rd, Qufu, Jining, Shandong Province. Confucianism is one of the oldest and most influential philosophies in China. Many temples are dedicated to Confucius in every province of China, but being Qufu his birthplace, the one located here is the most important. It is the earliest, built in 478 BC after Confucius death, and it is also one of the biggest architectural complexes in China after Beijing's Summer Palace and Chengde Mountain Resort. The main hall called Dacheng hall meaning 'Master with great achievements' was renovated for the last time in 1724 and is the tallest building of the complex reaching almost 25 metres (81 ft). 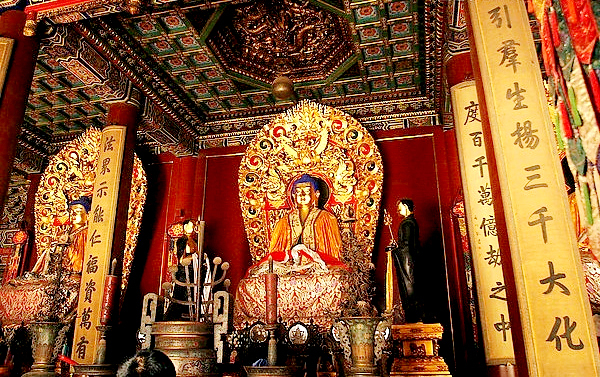 It houses a huge statue of Confucius sitting on a throne. Altogether there are nine courtyards. Moving further there is the Apricot Altar which includes a finely decorated pavilion and is the place where Confucius used to teach to his students. Finally, there is the Great Pavilion of the Constellation of Scholars, an ancient two stories wooden library that contains many classic books and writings donated by emperors and kings. The most important temple in Tibet which is considered one of the spiritual hearts of China where every year Buddhists on pilgrimage travel. Wencheng from China and Bhrikuti from Nepal. Both brought important Buddha statues to the temple. 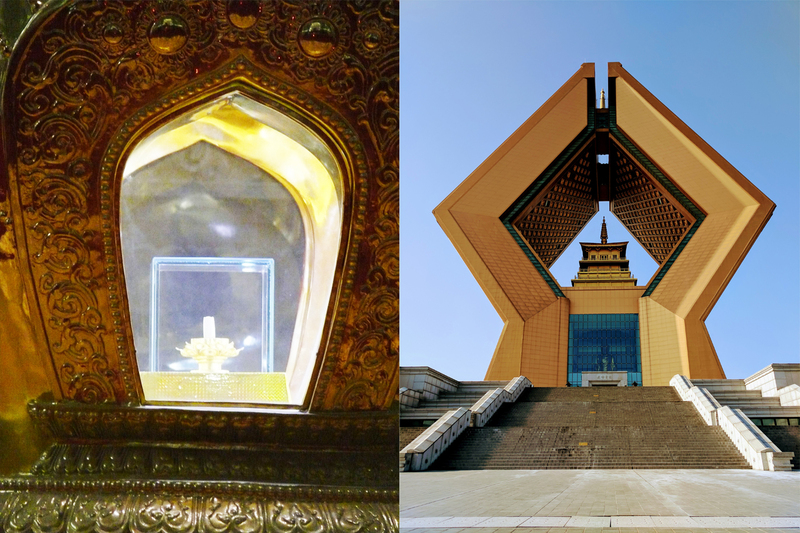 One is the Sakyamuni Buddha statue, while the other Jowa Sakyamuni brought from the Chinese princess and known as Jowo Rinpoche became the most revered Buddha statue in China. The temple covers an area of 2 and a half hectares, built from east to west and has two floors and featured eight rooms. It was subsequently enlarged during the Ming Dynasty around 1400. 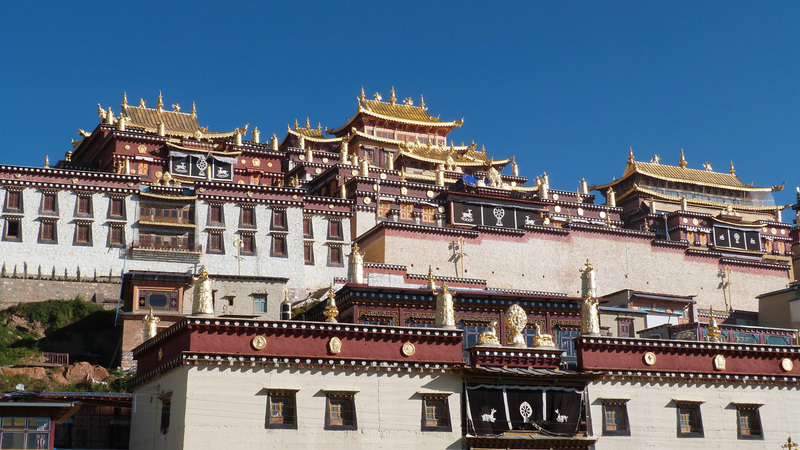 Also, from the rooftop, it is possible to enjoy a spectacular view of the Potala Palace. Apart from the two mentioned the temple houses many other important statues and relics. In one of the most famous districts in the centre of Beijing, tourists can visit this amazing place. It used to be the residence of Emperor Yong Zheng and only later became a temple, around 1744. It is one of the most important Buddhist temples in China and as soon as one steps inside it can distinctively feel the powerful atmosphere surrounding this whole place. Furthermore, the temple features fine frescoes, each hall is finely decorated and the last building hosts the tallest sandalwood Buddha statue in the whole world (60 ft, 18 metres and reaching 26 metres if considering the pedestal). The main building, called Hall of Harmony and Peace. 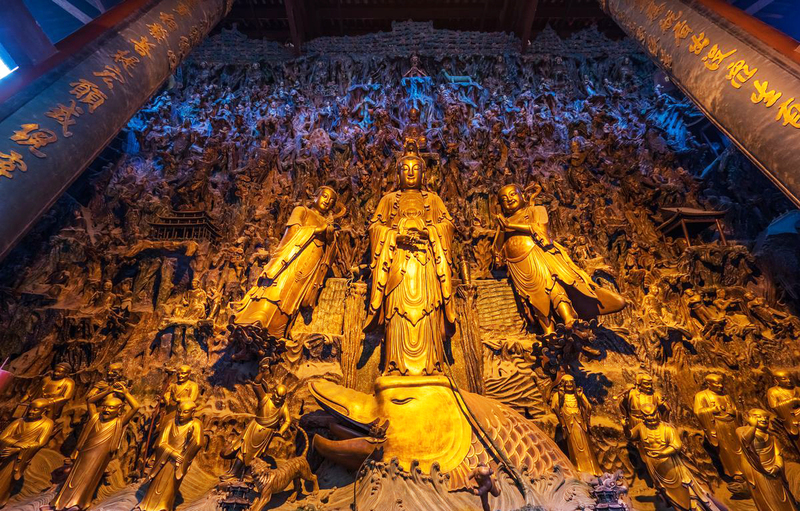 It hosts three bronze statues of the Buddhas of the Three Ages. The temple location is also very convenient. 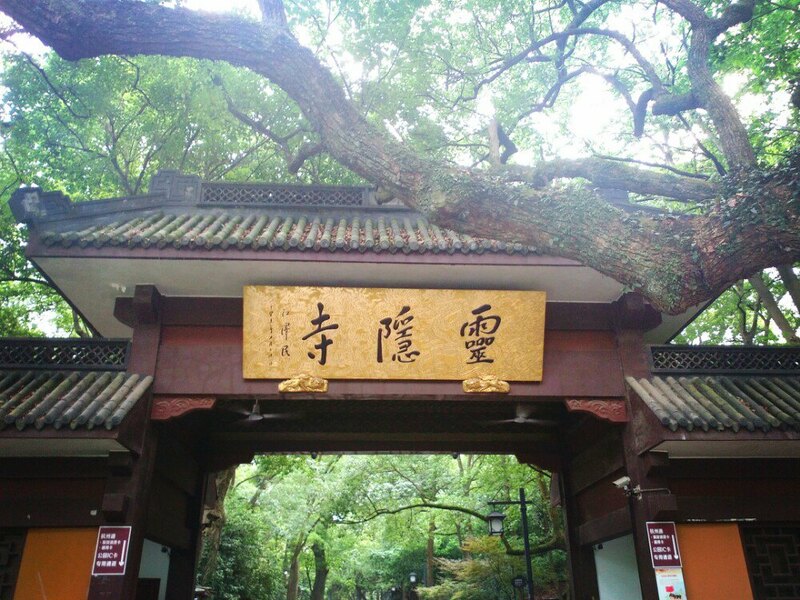 It is right next to one of the oldest Hutong areas (traditional streets of old Beijing) and a couple of minutes walk from the Confucius temple. 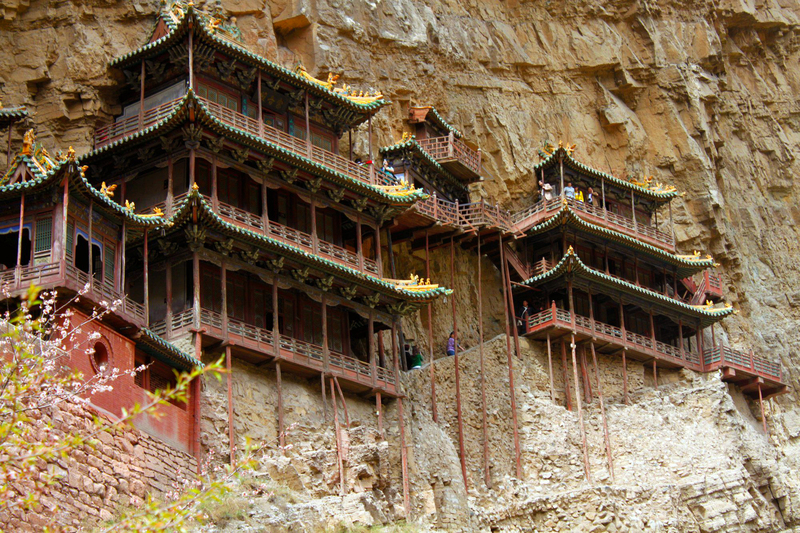 As its name suggests, is a temple built into a cliff incredibly and 50 meters above the ground. The pillars were not present at the beginning and were added later as no one trusted it to hold without any visible support, in fact, the upholders are hidden in the rock. 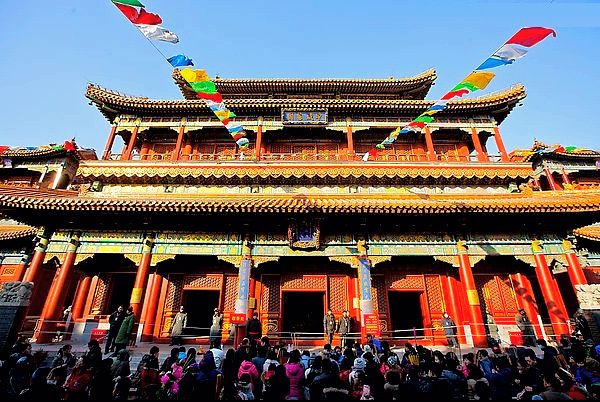 The Hanging Temple, built around 491 AD is also the only existing temple were a combination of China’s three traditional religions Buddhism, Taoism and Confucianism have been practiced. The Southern Pavilion is a three-story building and its the main one. It includes the Sangong Palace which is the biggest hall. The Northern Pavilion despite being smaller holds the statues of the founders of three religions - Sakyamuni of Buddhism, Laozi of Taoism and Confucius of Confucianism. Beautiful carvings and various statues can be seen in the temple. It's a sight to behold, but unfortunately, the access to the monastery might eventually be closed due to the way too large number of visitors. 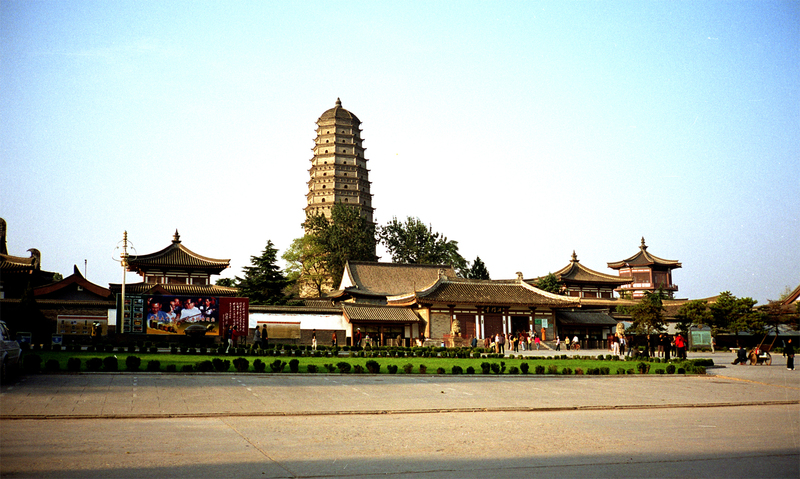 The temple location is outside the walls of what used to be the ancient Eastern Han capital, to the east of Luoyang in Henan Province. According to the tradition, the White horse temple is the first Buddhist temple in China, built around 68 AD by the Emperor of the Han Dynasty after dreaming of a golden Buddha. He received two Indian monks who were persuaded to bring important scriptures to the temple and reached it riding white horses. After them, in ancient times many documents were gathered for translation, and the temple became an important centre for scriptures translation. Throughout the years the temple was damaged and refurbished many times during both Ming and Qing dynasty and finally even after the Cultural Revolution. Luckily part of the most important relics survived. As with other temples, it follows a north-south pattern facing south. Outside the temple towers the Qiyun pagoda, with a restricted entrance where the monks live. 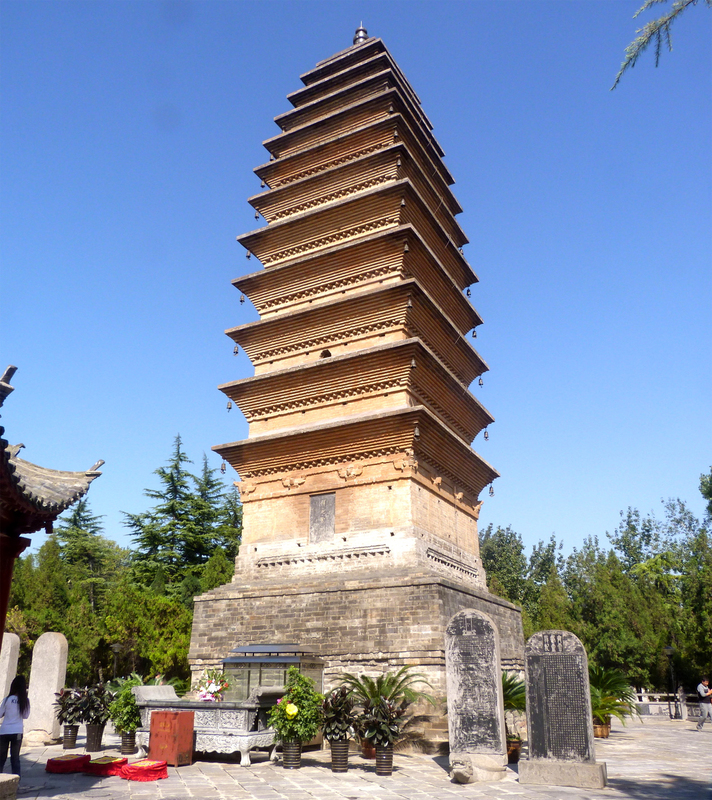 This 82ft (25 metres) tall pagoda is the oldest in China as well, built around 12th century. Highlights: Feilai Peak, Hall of Heavenly Kings, Palace of Medicine Buddha, Statues in the Grand Hall. Lingyin Temple is one of the oldest Buddhist temples in China. It was first built around 320 AD by an Indian Monk. The name he chose means Soul's Retreat and this place definitely conveys such a feeling. Outside Hangzhou and almost completely surrounded by nature this place makes tourists forget about the bustling city. The temple was expanded in subsequent dynasties reaching today's noteworthy size. 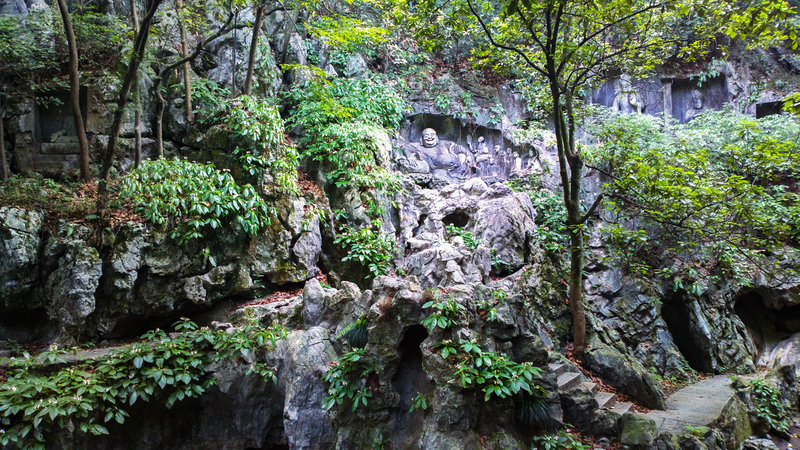 As the temple gained importance the adjacent Feilai peak also became renowned as an important Mountain for Buddhists. It is, in fact, one of the most special characteristics of this place. 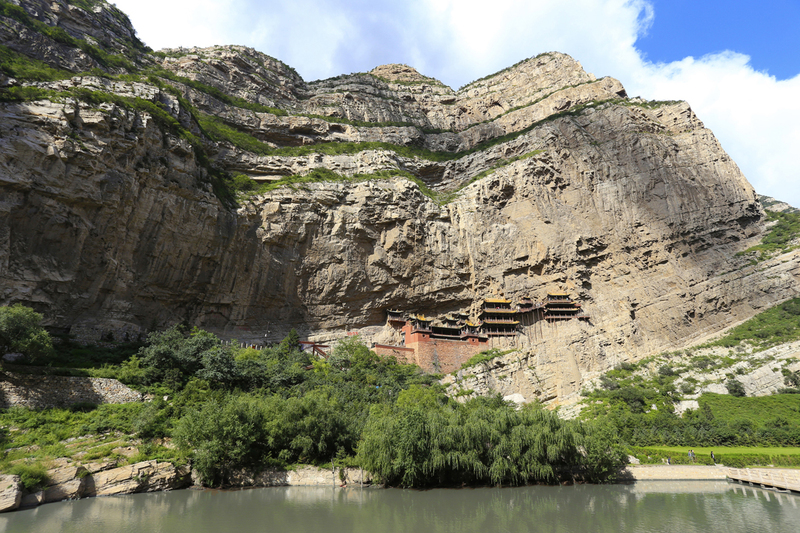 Apart from the temple itself, the whole rocky side of the path leading to the temple and Feilai peak grottoes are literally dotted with carvings and ancient Buddha sculptures. Among these, there is the famous statue of Maitreya Buddha, the representation of the fat laughing Buddha. This path is as much as a unique attraction as the Temple. The halls are richly decorated and the Mahavira Hall holds the biggest Sakyamuni Buddha statue in the lotus position in China. Yes, we wrote 10 not 7 temples at the beginning. Three that made our personal top 10 were already included in previous articles. So we invite you to have a look below as well! At number 8 it is a very important temple for Chinese tradition, beautifully located and full of invaluable relics is Nanputuo temple, mentioned in our Travel Guide to Xiamen. Our choice of 9th spot is Tanzhe temple, the oldest Buddhist temple in the Beijing's area. Described in our Travel guide to Special hidden locations in Beijing. Last but absolutely not least, comes the Shaolin temple. Probably the most renowned Chinese temple around the world thanks to the martial arts practised here and the incredible disciplines perfected by its monks, it is visited annually by over a million people. 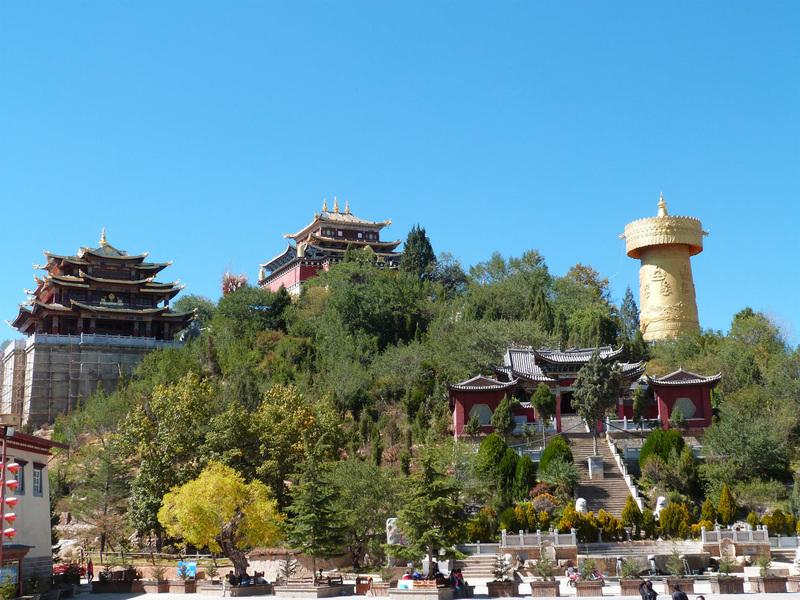 We dedicated an entire article to it that you can check here: Shaolin temple. Discover new exciting locations you must add to your travel list!